Shizuoka Performing Arts Park is the center of activity of SPAC which lies on the northern foot of the Nihondaira plateau with an area four times that of Tokyo Dome. This park of deep green is dotted with the headquarters, open air theatre “Udo”, ellipse theatre “Daendo”, as well as buildings for rehearsal, training exchanges and accommodations. 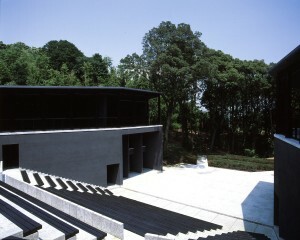 Box Theatre is a simple black box shaped theatre inside the rehearsal building. 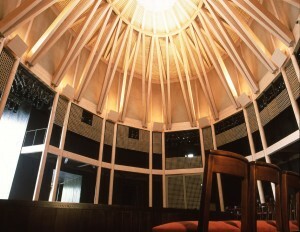 The stage and seating can be arranged at will for each and every performance where the unity with the audience can be enjoyed to one’s heart’s content. 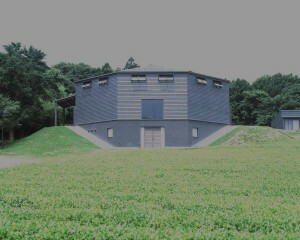 Attached, is Rehearsal Room One, which serves, making best use of its comforting wood design, as a space used for SPAC actors’ daily training. These are the accommodations where people from all spectrums of the performing arts who visit SPAC from home and abroad stay to strengthen relations through production of pieces, presentations, research and discussions. Next to the security room by the entrance of the park is our cafe KACHI KACHI YAMA. It is used as the cafeteria for cast and crew during production and used as a resting place for the audience during performances. This building houses the office of the Art Agency, the Artistic director’s office, meeting rooms and archives.